Causes being supported this year. In the Village - Cerne Abbas Water Meadows. The Water Meadow Trust is in the process of becoming a village Trust. It needs funds and volunteers to ensure it becomes a wildlife area for the benefit of the whole community. The water meadows have participated in Open Gardens since 2015. Weldmar Hospicecare is a charity that provides end of life care for people living in Dorset who need our specialist support. Our compassionate approach supports patients and their families, medically and in other ways, in the community, in our hospice and at home. 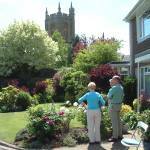 Weldmar Hospicecare is an independent charity only working in Dorset. 25% of our funds are provided by the NHS – 75% of our funds are raised thanks to the support of our local community.